Hi Friends!! I just wanted to share a simple, but cute little card. 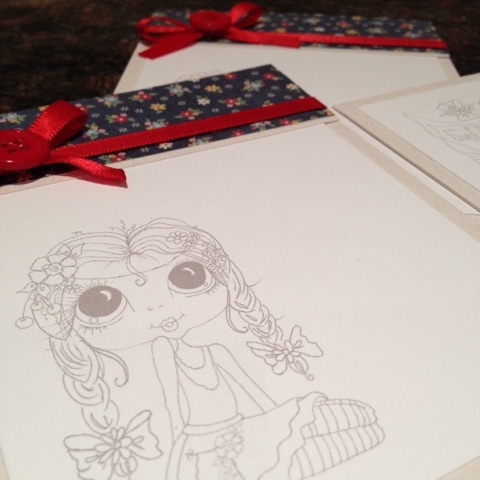 If you are interested in purchasing this precious digi stamp please click here. 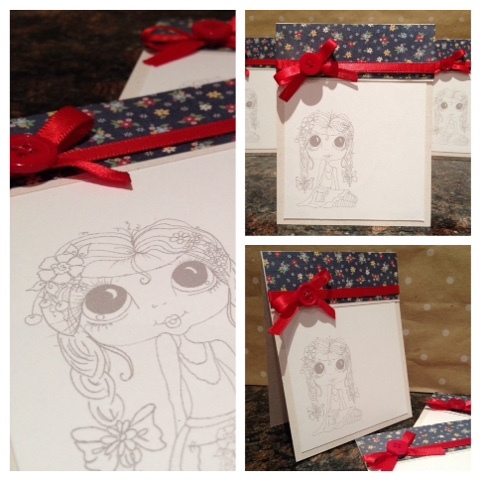 I only added 5 layers of paper, created a paper flower, a banner and added a few pearls to create this cute card. Hope you guys like it! I added a very light shading of blue around all of my images to give the illusion of the bright blue sky behind them. I also added grass to give them something to stand on. Sometimes I use grey's as a shading background if I just want to give them something to stand on. Hope you like this idea and try it. Have a great day! Happy Tuesday Everyone! It's Beth. I had so much fun creating this notebook. I will be making a few of them to put in my gift closet for quick grab gifts. 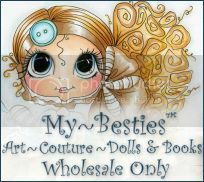 This sweet girl is Bestie image#372 at Sherri Baldy's Etsy shop. 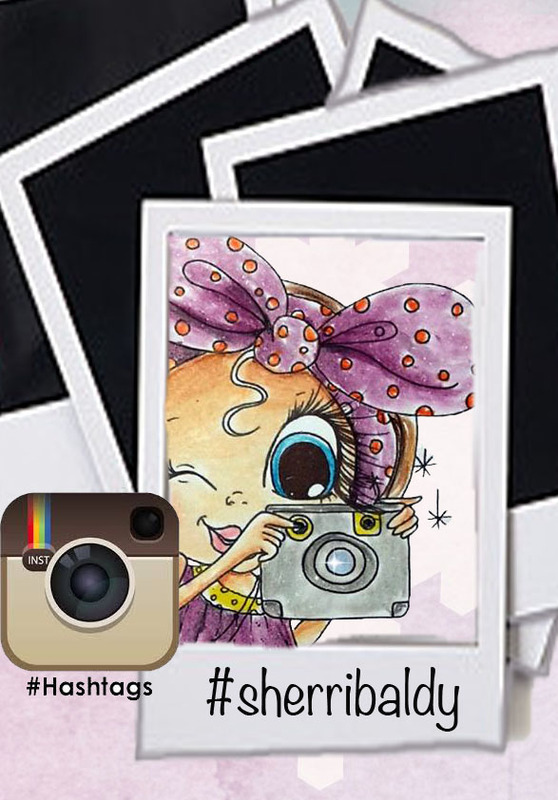 I created a fun notebook with this cute image. 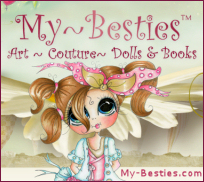 I can't help but smile when I use the "Bestie" images. Skin and hair can really challenge me. When I started with this image I had no idea what I was going to do or make. I just started coloring. I always start with the skin and work from there. These are the skin colors I used. I am always learning. I used a lot of ink working on her hair. I have found that I like to let the layers of ink dry as I go along when doing hair. It doesn't get as "muddy " in my opinion. I did end up adding more depth to her hair after I finished her clothing. This was super fun. I was able to use up lots of odds and ends in my craft room. Yippie!! I used various ribbons and some Kaiser Kraft and Prima flowers. 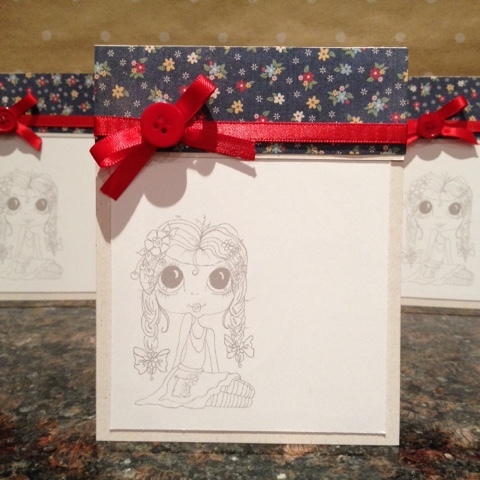 The note book is 5x7 kraft paper cover lined book, which are sold at Walmart 3 to a pack. They are only available when the back to school supplies are out. 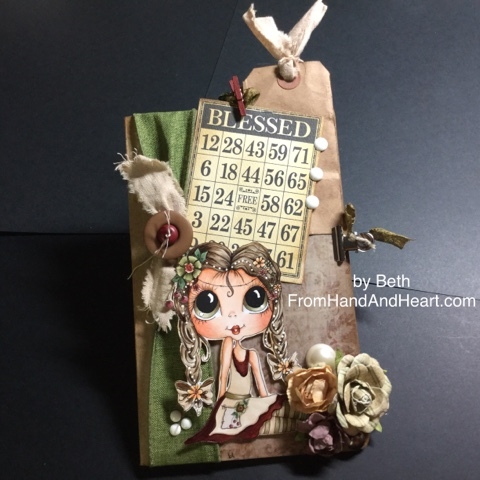 Tim Holtz printed vellum is covering part of the cover. The Bestie is image #372. Hope you enjoyed this project! Additional information can be found at FromHandAndHeart.Com. 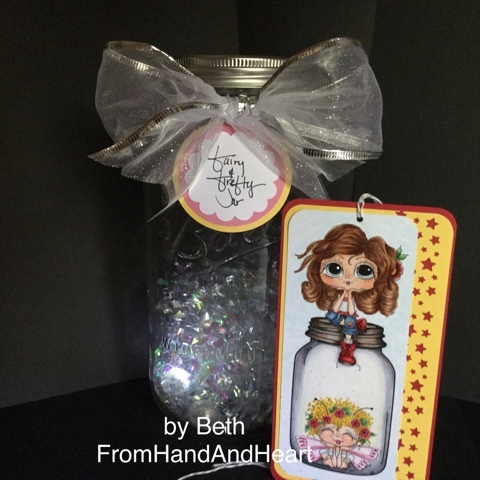 Thanks so much for looking at Sherri's Blog. 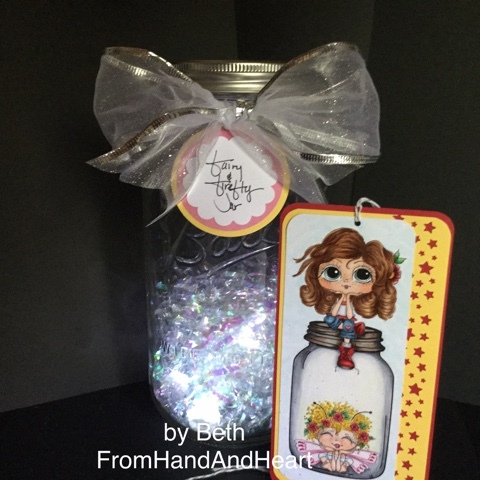 So many great Ladies posting amazing projects here! Until next time. Happy Crafting! Welcome back! 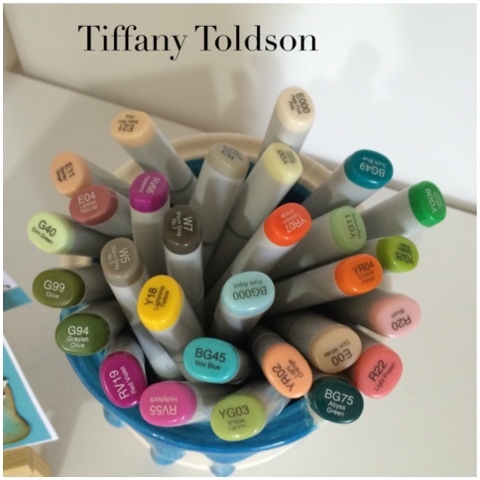 It's time for another Create and Color post from yours truly, Tiffany. 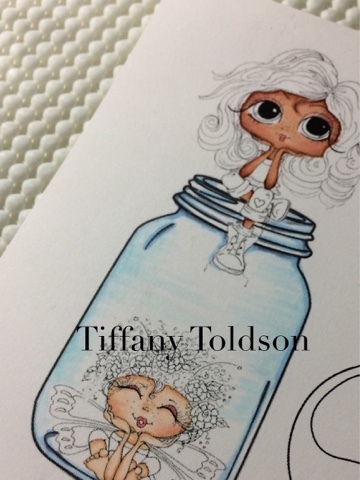 I colored this cute little fairy in a jar using my Copics. 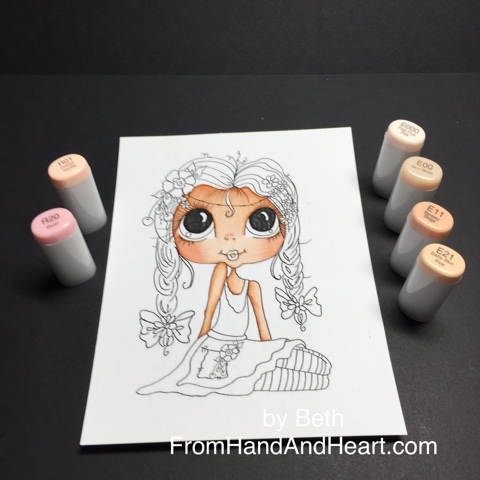 I must say Fairies are one of my favorite things to color. You can do so much with them. I really enjoy coloring their wings two tone. 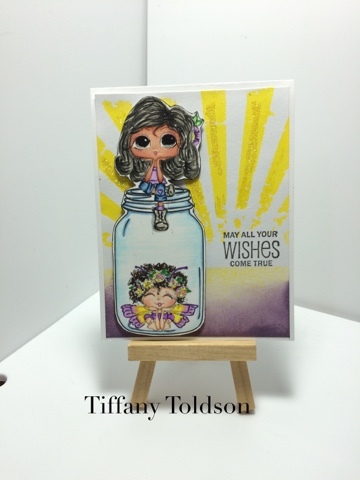 I used Tim Holtz Rays stencil for the background and sprayed Dylusions Lemon Zest, along with Dusty Concord Distress Ink along the bottom. 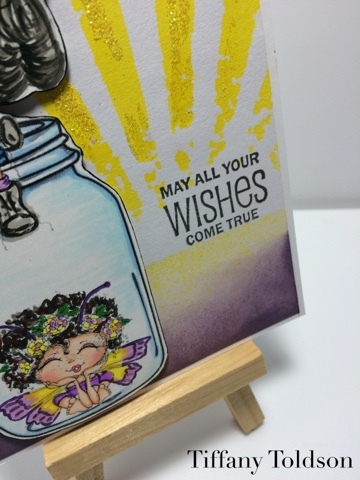 I then finished it off with a simple stamp from Studio Calico monthly kit. Hi Friends!! 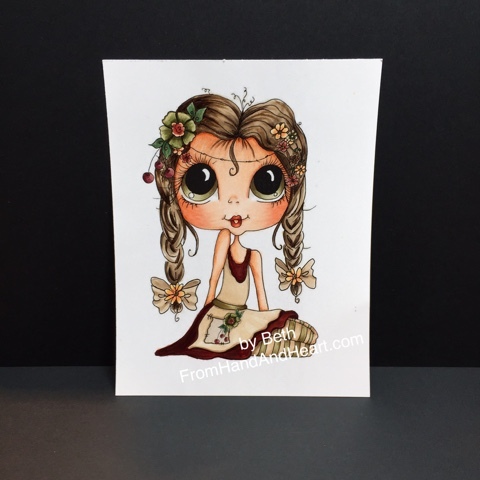 I wanted to share this beautiful Bestie digital stamp I colored with my copic markers. I wanted to highlight her hair. I started by coloring her hair with my markers. 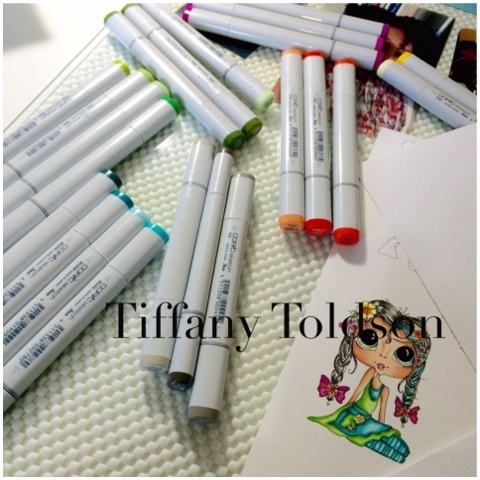 I then added small dots with my white jelly roll pen. I think it turned out beautiful. I even added white highlights to her clothes and lips. I hope you guys like the effect it gave. 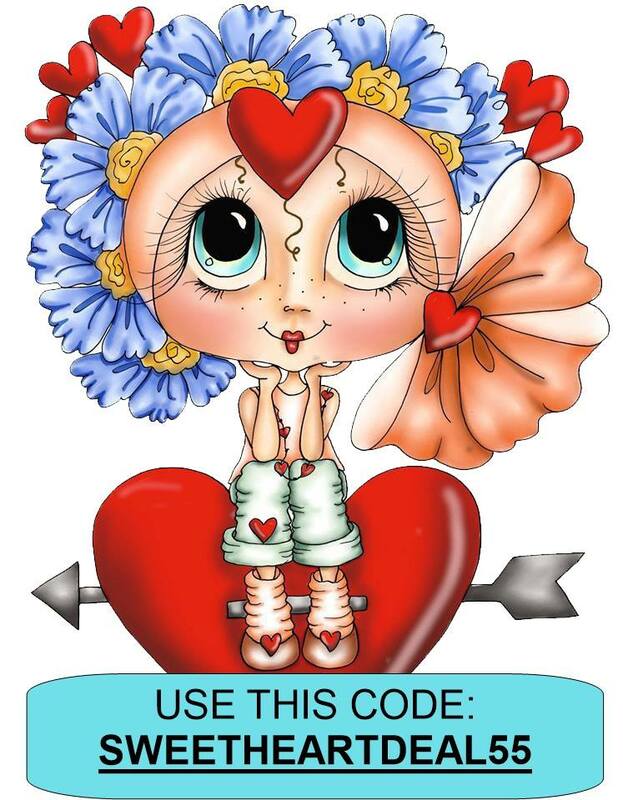 If you would like to purchase this stamp please click here. Have a great day! Hi Everybody, Beth here. I am so happy to be able to share this project. I had so much fun working with the Bestie Image "Captured Fae". 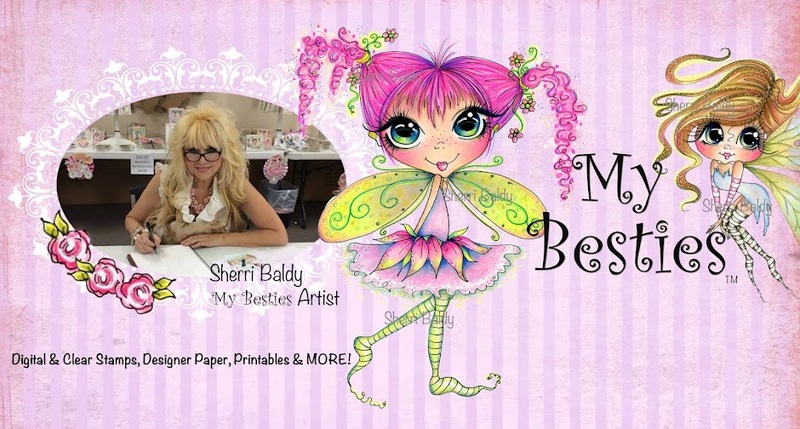 You can find the image here at Sherri Baldy's Etsy site. It was fun choosing colors for this Bestie. 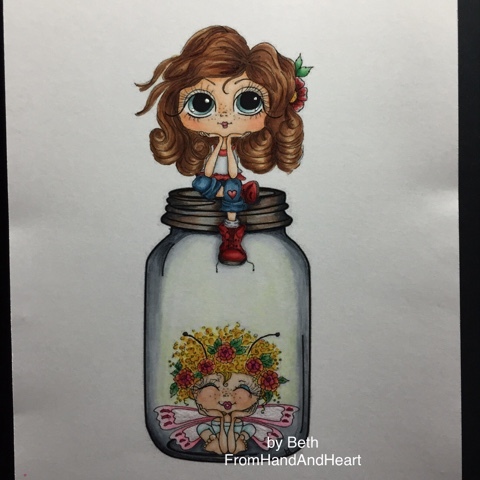 I must say the jar and the red boots were both challenging and fun. 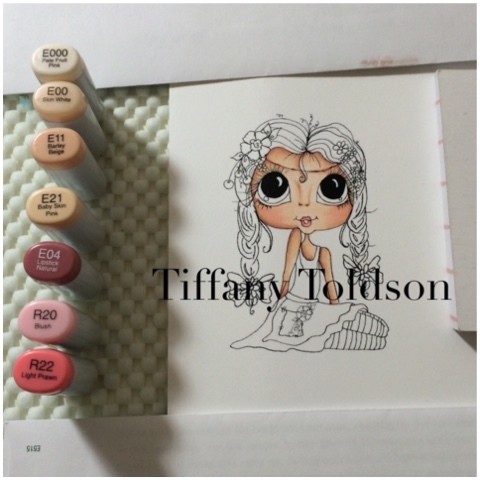 For the lid I started with the cool greys C0,C1,C3,C6,C9 then I went in with E59 and W3. And did some blending with B41. 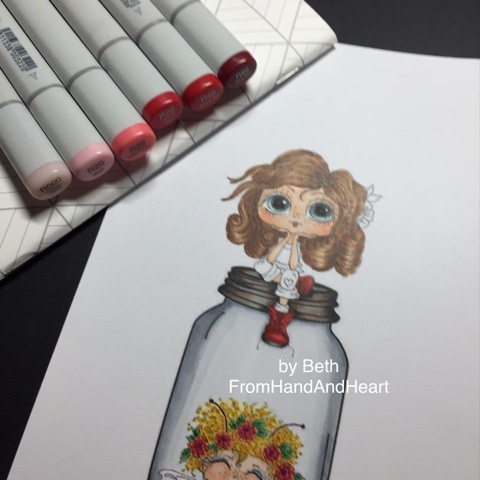 I did color a couple of lids before I liked the results. I hope you enjoyed this project. 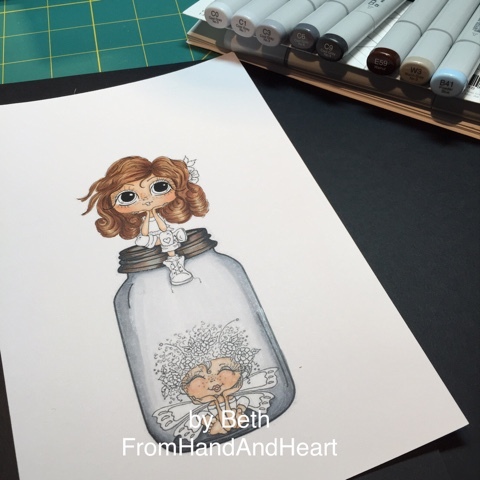 It's fun to do different projects with My Besties images. You can find the image "Captured Fae" here. Hey! 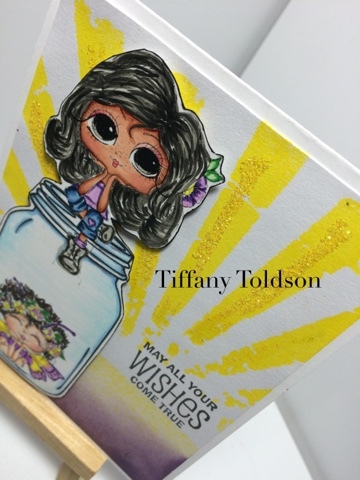 It's me againTiffany Toldson, here with another fun card. I used this My Bestie image, which I thought screamed Happy Spring. 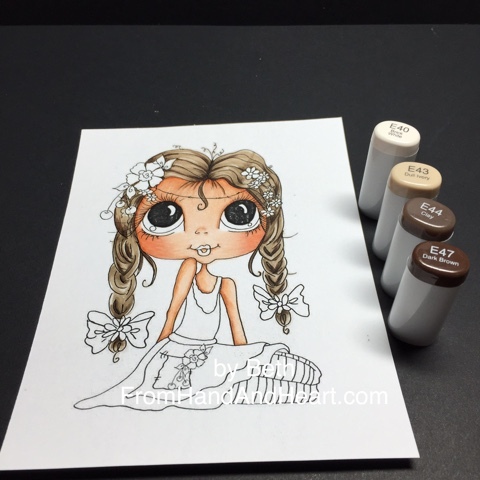 Though E04 is a low number it's darker then the E11/21 so I used this color to add depth and richness in her skin tone. 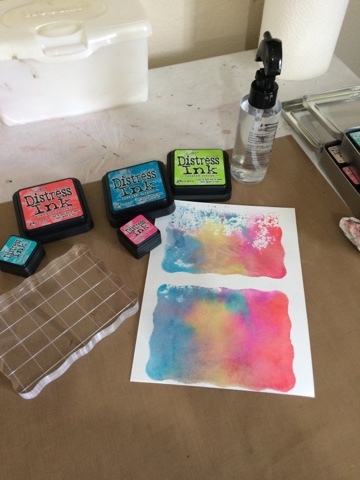 After looking through my paper I decided to go with the color scheme from my June Simon Say's Stamp card kit. 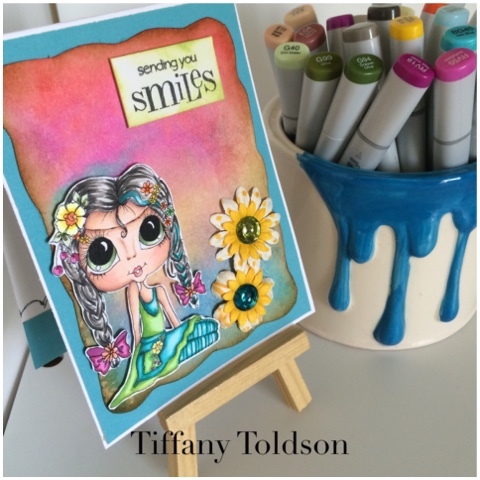 I wanted to do a Mix Media style card base so I only use the turquoise paper from the kit which is from Doodlebug Design 6x6 paper pack. The process for the base of my card... I took Tim Holtz, Twisted Citron, Mermaid Lagoon, Abandoned Coral, Picked Raspberry and Peacock Feathers distress inks and wiped each one across the smooth side of my acrylic stamping block, then I sprayed some water over the top. Once I liked the way the colors were mixed I layed it on some white water color paper. It was quite wet so I took a kitchen roll and blotted the extra. At first I only chose 3 colors but I didn't like the way it turned out so I added two more. 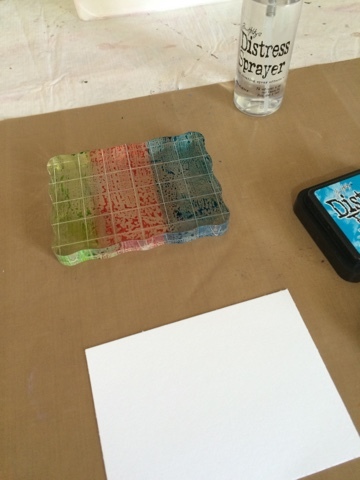 This is what it looked like once it was blotted dry. I then cut around the wavy border and inked it with Vintage Photo distress ink. 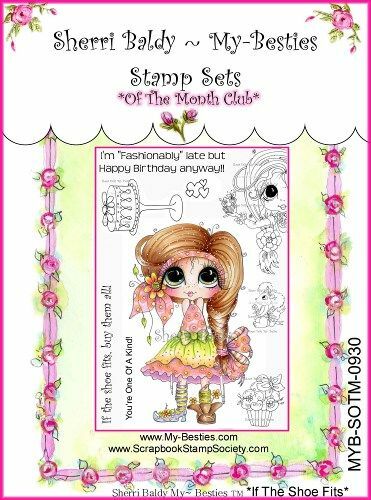 I added two Prima paper flowers along with a Sentiment from Sweet Wishes stamp set by Penny Black that also came in my Simon Say's Stamp June's kit. Thanks for joining me today. Please contact me if you have any questions. Not quite a 5 minute project, but for sure less than 30. To get perfect placement for the actual card, I first printed an image for my template onto a piece of printer paper. I secured the card panels one by one on top of the printed image, giving me perfect placement and then re-ran it through the printer. I did not want the image to be in black so I changed the color to a shade of grey to give it a softer look. I offset the image so that I will have room to add a sentiment later, a few color blocks with some ribbon and just like that I have some ready made blank cards for the next the next occasion. Quick and easy, I hope you will give this technique a try this. Thank you and until next time enjoy "creating something handmade"